This story happened during the Qin Dynasty (qīng cháo 清朝, 221BC-206BC). There was once an old man named Meng (孟 mèng) who lived in the southern part of the country with his wife. One spring, Meng sowed a seed of bottle gourd in his yard. The bottle gourd grew up bit by bit and its vines climbed over the wall and entered his neighbor Jiang’s yard. Like Meng, Jiang (jiāng 江) had no children and so he became very fond of the plant. He watered and took care of the plant. With tender care of both men, the plant grew bigger and bigger and gave a beautiful bottle gourd in autumn. Jiang plucked it off the vine, and the two old men decided to cut the gourd and divide it by half. To their surprise when they cut the gourd a pretty and lovely girl was lying inside! They felt happy to have a child and both loved her very much, so they decided to bring the child up together. 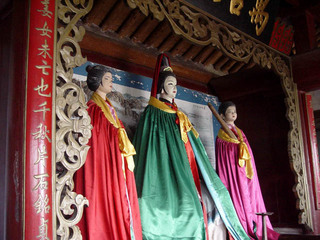 They named the girl Meng Jiangnu (mèng jiāng nǚ 孟姜女), which means Meng and Jiang’s daughter. 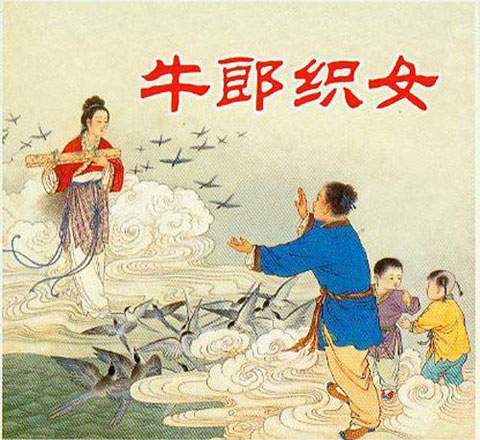 The Cowherd and the Girl Weaver (niú láng zhī nǚ 牛郎织女) is one of the Chinese four great folklores. It is concerned with love, which reflect people's recognition of true love. 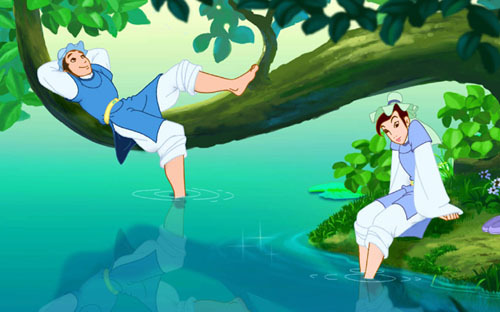 As the story goes, an honest cowherd had been so kind to his ox that the creature told him of a secret pond where the beautiful daughters of the Emperor of Heaven (yù dì 玉帝) bathed. If the cowherd stole one of their clothes, she would be unable to escape and become his wife. As it happened, the girl happened to be the seventh, youngest and most beautiful, daughter of the Emperor of Heaven. They fell in love and lived together happily for many years and bore two children. Olympic mascots were unveiled exatly 1000 days before the Beiling Olympic opening ceremony . The long--anticipated mascots feature four of China's most popular animals--the fish,the panda,the Tibrtan antelope and the swallow .The fifth mascot is the brightly burning Olympic flame. Each of the mascots has a repeated two-syllable name. This type of name is a traditional way of showing affection for children in China.BeiBei is the fish,JingJing is the panda , HuanHuan is the Olympic flame,YingYing is the Tibetan antelope and NiNi is the swallow.When their names are put together---they say "Welcome to Beijing". The five elements of nature,including the sea,forest,fire,earth and sky are found in the mascot's origins and headpieces. These special headpieces also display the uniqur folk and culture of China. Each mascot also symbolizes a different blessing --- prosperity, happiness, passion, health and good luck. The music of Liang Zhu (liáng zhù 梁祝), or "Butterfly Lovers," is undoubtedly the best-known and most popular in all of China. It is also one of the few Chinese pieces that have often appeared on the international stage. Almost everyone in China can hum a few lines of the violin concerto, which can be traced to a Chinese folk legend "Liang Shanbo and Zhu Yingtai"(liáng shān bó yǔ zhù yīng tái 梁山伯与祝英台).